Establishing a business entity for your operation is one of the most important considerations as it relates to taxes. The five main types of business entities are: sole proprietors, LLCs, partnerships, corporations and S corporations. Unless you formally establish a business entity, you will automatically be operating as a sole proprietorship which opens your personal assets to potential business risk. In addition, you will also need to pay self-employment taxes. Forming a Limited Liability Company (LLC) and electing to file as an S corp enables business owners to avoid double taxation as it separates liability from the owner. This structure also allows you, as the business owner, to collect a salary and is especially beneficial if your business is highly profitable. For instance, if you earned $100,000 as a graphic designer in 2016 and filed as a sole proprietor, you would have paid self-employment taxes on the entire amount. However, had you created an LLC, and paid yourself a reasonable salary based on national or local benchmarks, only the salaried portion would be subject to self-employment tax. In some states such as Texas, you can register your sole proprietorship without filing any legal documents with the state. The business will usually be your full name followed by DBA “Doing Business As” which can be your trade name. For example, John Smith DBA The Donut King. This fictitious name serves as a protection mechanism for consumers. Along with establishing a business structure and registering, you must file for permits and licenses for your business. This will depend on your business type and location. Typical licenses are a business license, a professional license and a sales tax license. If you are unsure what your state requires, simply visit the Small Business Administration for more details. The IRS uses your tax ID to track all your business transactions. If you’re operating as a sole proprietor, you can use your Social Security Number for this purpose. However, we recommend applying for an EIN via the IRS. The application is free. Now that we understand the importance of business structures, let’s go over the specific deductions. Regular and exclusive use. You regularly use part or all of your home exclusively for conducting business, i.e. if you use an extra room solely to run your business, you can take a home office deduction for that room. Principal place of your business. You must prove to the IRS that your home office is the principal place of business. You are allowed to conduct business outside the home, but must substantially and regularly conduct business from your home office to qualify for this deduction. Once you confirm that your home office space meets this requirement, then it’s time to select your preferred calculation method. Most entrepreneurs who operate home-based businesses will choose the simplified method because, as the name suggests, it’s less complicated and easier to use. There’s no need to calculate actual expenses. All you have to do is multiply the square footage of your home office space (up to 300 sq. ft.) by the prescribed multiplier ($5 at the time of writing) to arrive at your deductible amount. For example, if your home office is 200 sq. ft. then your deduction will be $1,000 (200 x $5). Unlike the simplified method, the standard method can be more intimidating as there are many calculations and lots of steps. Measure the square footage of your office space. Remember this should only include real estate that is devoted for business purposes. Take photos of the space. Be sure to include a timestamp with the image as evidence in the event of an IRS audit. Calculate the total square footage of your home. You may be able to easily access this information by taking a look at your files from when you purchased the home. Divide the square footage of your home by the total square footage to determine the percentage of your home used for business purposes. TIP: If you elect the standard method, then file IRS Form 8829 along with Schedule C (Form 1040). Aside from your work computer and chair, if you’ve got any other equipment, furniture or even decor these can be deducted as well. Just remember they must be within the bounds of your home office space, permanently. If you conduct repairs on your home office or renovate your home offices space, these should be recorded as direct expenses. If you have a business cellphone or a business landline, they are both 100% deductible. However, if you only use your personal cellphone or landline to communicate with clients occasionally, you can still write-off these costs so long as you keep a record of the dates, times and duration of each call. You can also deduct a part of the cost of the internet, which almost every home business uses. Just be careful to choose a reasonably accurate percentage in regards to your usage. Indirect expenses: These benefit your entire home as well as your home office space. So if the percentage of home office works out to be 20% and your total utilities were $1,200 for the year, you can deduct $240 as an indirect expense. You can also write off a percentage of other home-related expense such as trash removal or snowplowing using this method. 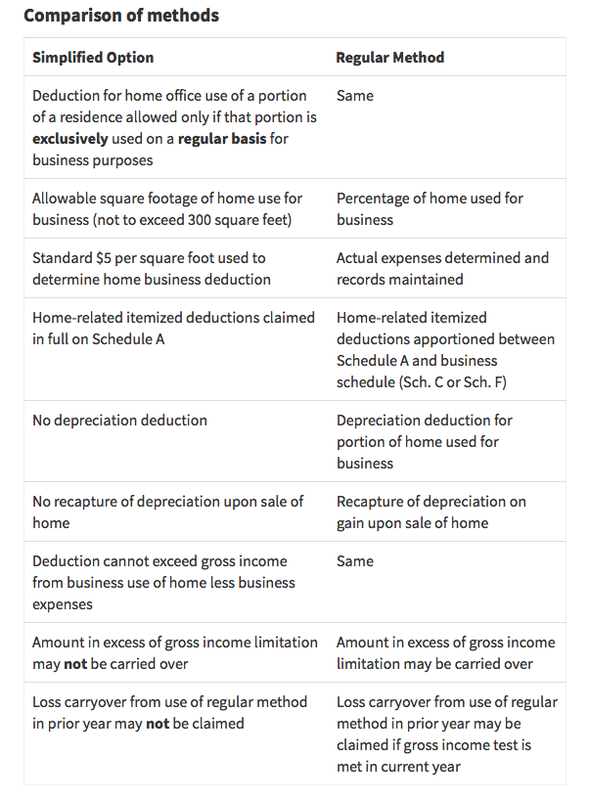 Property taxes and mortgage interest: You will need to reduce your personal itemized deduction by the amount being deducted for business purposes. Depreciation: If you own the home from which you operate, depreciate the part dedicated to the business. Note that if you sell your home in the future, the amount of the write-off is considered to be a taxable gain and thus subject to taxation. Driving to the gym or your local Starbucks, for example, cannot be deducted. The main purpose of the meeting is to discuss business. You engaged in a business arrangement with an individual during the entertainment period. There was a reasonable expectation of earning income at that time of the meeting or as a result of the meeting. Occurred directly before or after a substantial business discussion. In addition, you can also deduct meals purchased for yourself while on business travel, for example, attending a conference, seminar or speaking engagement. You may either deduct 50% of the cost of the meal or use the IRS Standard Meal Allowance as your guide. For more information on deduction of meals using the Standard Meal Allowance schedule visit GSA website. Who you met with. If you have a dinner meeting or party that you want to write off be sure to include the list of guests who attended this event, their job title, the location and date of the meeting as well as business topics discussed. Events. Your notes should include the purpose of any training events, seminars, etc. and how it relates to your business. Be sure to record the dates and topics covered in your journal. Business travel. Keep a log of all travel dates, the reason for travel, business-related mileage, lodging and all other expenses. Keep copies of your business credit card statements as well as receipts for items over $75 in this journal. Apart from keeping track of key dates, events and receipts, it might be time to invest in accounting software to start streamlining many of these processes. There are many home business software options to choose from depending on your needs. For example, if you’re merely testing the waters with your consulting or freelancing company you may want to try some home business accounting software without breaking the bank. Many accounting services allow you to download a version of their software for free. But with Wave’s accounting tools, you get to use the full version of the software for absolutely free. It’s not a trick; it’s $0 per month and there’s no hidden fees later on. Zoho Books offers another option through its online, cloud-based, mobile solution designed to help you track expenses, send invoices and pull powerful reports. You can integrate it with many other popular apps, like PayPal, Square, Track1099, Dropbox and more. You may have also heard about QuickBooks which is considered to be the industry standard when it comes to accounting software. The QuickBooks product suite has something for almost everyone, from the huge enterprise to the LLC that consists of one person who works from home. 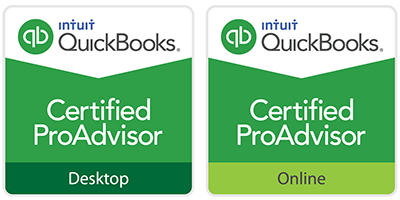 QuickBooks offers something unique for small businesses. You can use and pay for only the features that you need, making it a fairly cheap option. Also, the company that owns QuickBooks, Intuit, offers personal budgeting software called Mint that may come in handy for expense tracking. There are many moving parts when it comes to small business tax preparation for your home-based operations. Inaccurate estimates when filing your taxes can open you up to a potential IRS audit and penalties. Therefore, as you continue to grow your small business, we recommend hiring a tax professional like Ignite Spot who can help you to get it right the first time. 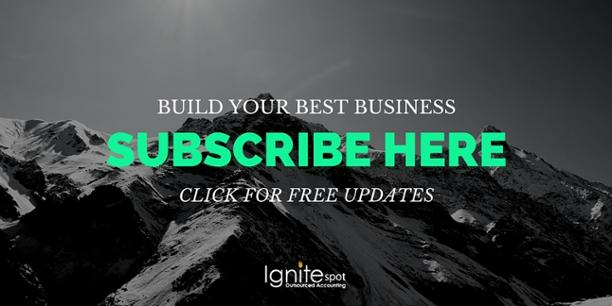 Simply contact the accountants at Ignite Spot to see how we can ensure your small business is tax compliant year-round and remove the stress of tax season for good.